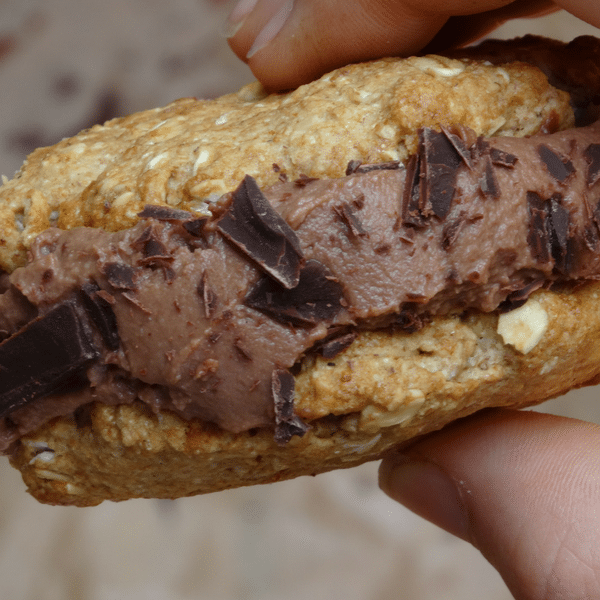 Chocolate ice cream studded with chocolate chips smothered between two lovely, crunchy oat cookies – Drooling yet? Wait for the pictures hehe. I chose this recipe as my favourite as it really is quite easy, yet it makes the perfect summer treat or after dinner dessert! There also is a bit of a personal story behind it as these pictures actually are some of the very first shots that I was really proud of. I am not a professional food photographer – I wish! – but after checking on the shots I took of these sandwiches I felt proud as I genuinely enjoyed the outcome. Life got busy and I didn´t have the time or the motivation to continue practising my photography. (Honestly, I also was quite frustrated after taking more pictures of different dishes that never turned out as good as these particular shots.) So I put my camera aside and moved on, slowly forgetting about all that for a while. Until recently! I somehow have found the motivation to prepare beautiful foods and to take nice pictures of it again. I still am not an expert but I know that failure is a part of success and nothing worth having comes easy. I try my best to enjoy the process and the journey of my very personal food photography and would like to share this personal journey of mine with like minded kind hearts out there via my Instagram page @planty.of.food. I am so happy to share the recipe for this with you and want to say a BIG thank you to you at YoHome for giving me the opportunity to be creative and to share my passion with others from all around the world! Here we go with the recipe – I hope you enjoy it as much as I do! Mix together all of the ingredients and form a dough ball. Add more flour or liquid as needed. Divide ball into six equal sized portions, roll balls and flatten out onto a baking sheet lined with parchment paper. Then bake at 180°C for 20 minutes. Blend all ingredients in a high speed blender until smooth. Pour into an ice cream maker until it has a soft serve like consistency. Then use as much ice cream as you like to put between two of the cookies and sprinkle with chocolate chips for garnish. Serve immediately or pop in your freezer. Alternatively (no ice cream maker): Pour the ice cream base into little ice cube moulds and freeze until solid. Remove from freezer and let thaw for about 10 minutes before putting the cubes into your blender. Now blend until you have a soft serve consistency, similar to nice cream making with frozen bananas. Then continue as mentioned above and enjoy!